Now, at long last, we have a fun exercise that helps our kids practice deception. Card shark (Uncle) Bob blew through town, unhappy that he didn't have an opportunity to fleece his fellow train passengers of their savings through poker. 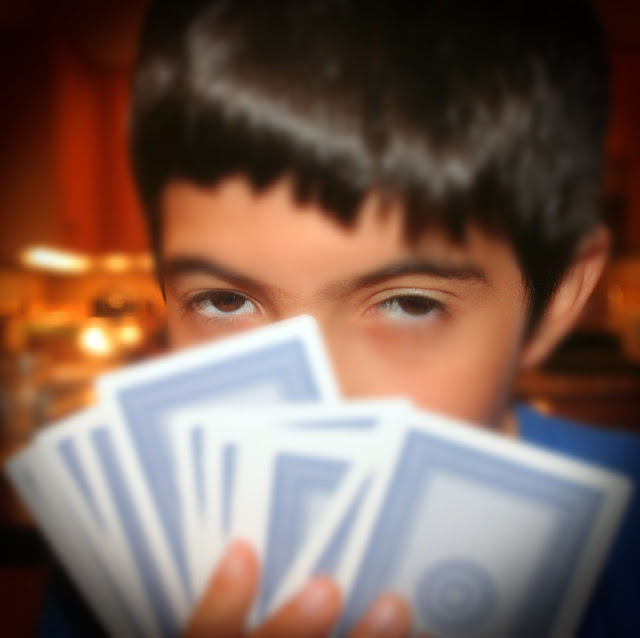 Perhaps realizing that the kids didn't have the scratch for high-stakes poker, he taught us another game where bluffing is tantamount, the "I Doubt It" card game. I had learned this game in a slightly different way, but the version we all enjoyed is when players must all (pretend to) play the same rank of card until someone challenges. You can read the rules here. The 8-year-old and the 11-year-old really took to the game, which requires some strategizing. They were both able to win while I came up short -- not because of honesty, but for a failure of mental calories. This is a great game because one can be creative with the different methods of deception. My daughter would lure people to doubt her cards by having all four of a rank then only playing one at a time. The first time she tired this I believe 10 cards were played representing the four 4s. I'm hoping our interest holds until Bob comes back so the kids can further teach the teacher.